4D Scatter Plotting | Inventing Situations. I recently read Edward Tufte’s ‘Visualizing Quantitative Information,’ a classic book on visualizing statistical data. It reads a little bit like the ‘Elements of Style’ for data visualization: Instead of ‘omit needless words,’ we have ‘maximize data-ink.’ Indeed, the primary goal of the book is to establish some basic design principles, and then show that those principles, creatively applied, can lead to genuinely new modes of representing data. One of my favorite graphics in the book was a scatter plot adapted from a physics paper, mapping four dimensions in a single graphic. It’s pretty typical to deal with data with much more than three dimensions; I was struck by the relative simplicity with which this scatter plot was able to illustrate four dimensional data. In the main grid of the 4D scatter plot, each of plots shows petal length vs petal width, for a range of sepal lengths and sepal widths. As one moves through the scatter plots to the right, the sepal lengths represented in the scatter plots increase; you can think of a row of scatter plots as frames in an animation where the sepal length is acting as ‘time.’ Likewise, as one moves up through the plots, sepal width increases. On the top and right side, there are marginal plots of sepal length vs petal width (top), and sepal width vs petal length (right). Note that the divisions of the smaller scatter plots give the binning of sepal length and width: notice that there’s only one blue dot in the middle column of the scatter matrix, corresponding to the right-most dot in the marginal plot at the top. Finally, the upper-right gives space for one more plot, which I’ve used for an overall marginal plot illustrating just petal length vs petal width. Scatter plots can use a few other tricks for packing in a bit more data: point size, transparency, and color add a bit more data, but are usually useful mostly for comparison of points, and can be impossible to read if over-thought. I tend to think of each of these as a half-dimension: Color in particular tends to fail if used for more than a few discrete labels, or if more complicated than a simple two-color gradient. 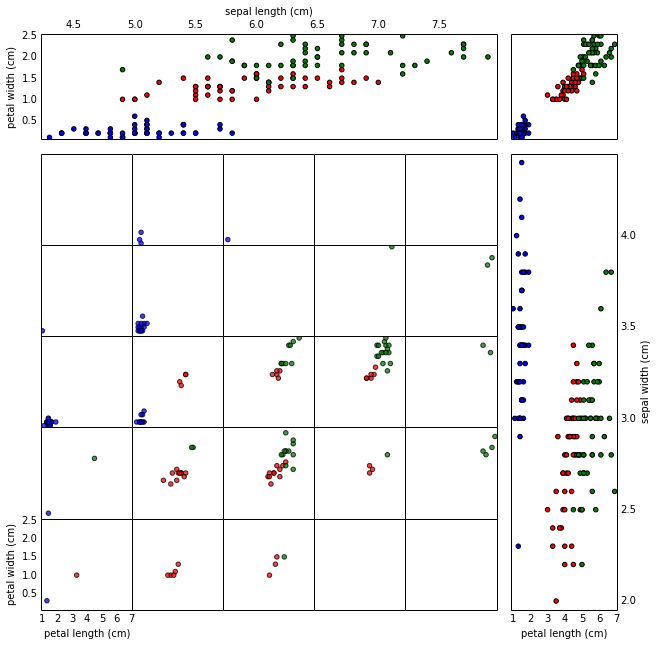 A scatter matrix. Each plot shows the scatter of two variables. It’s advantage is that one can have any number of variables (not just four), but one loses the sense of how pairs of variables change as a third variable changes. The plots on the diagonal show the single-variable distributions; this feels a bit like wasted space, though in this case we see that petal characteristics on their own make it very easy to separate the versicolor irises.